Happy Birthday, Meat Loaf! So, How DID He Get That Name? It's a simple question, but it's endured--and hasn't really been definitively answered--over the decades. What is the real deal behind iconic musician/actor Meat Loaf's stage name? The superstar, who was born Marvin Lee Aday in Texas and turns 65 on Thursday, has a long history of creating stories to answer this query--it's actually become part of the legend's legend itself. Nearly every profile of him out there notes the dozens of tales that he's told in order to explain the unusual moniker; ranging from the logical (it originated from his high school football coach in relation to his girth), to the bit insane (he allegedly allowed a Volkswagen Beetle to be pushed over his head on a dare, resulting in his friends calling him "meatloaf for brains"). It's tough to tell which is the absolute truth, or whether all the explanations have a grain of truth to them. As he noted in a 2003 interview, "Names and ages piss me off. So I just continually lie." One thing does stand out as the most probable factor for the nickname--Meat Loaf's considerably large size and issues with weight, which started at an early age. In fact, he has a particularly heartbreaking story about his struggles in that department. "When I was a kid I was so big--I was really big--that I literally could not wear blue jeans. My mother would take me to Sears, and they didn't make blue jeans that would fit me," he told CNN's Piers Morgan last year. "So I wore pleated pants in the first grade. And a commercial came on the air when I was about 5 or 6 years old, from Levis. And the commercial was 'Poor fat Marvin can't wear Levis.'" Meat Loaf explained that although he did have the nickname "Meat" at the time, some people still called him Marvin. However, "After that [commercial], NOBODY called me Marvin." The future entertainer was so traumatized by the experience that he decided to legally change his name to Michael as an adult. "I went before a judge in Connecticut in 1984, and I told him this story. And he said if it was today, I'd own the company." However, whether Marvin/Michael or his oft-questioned nickname, it's hard to deny that the former kid-in-pleated-pants' career has been one of the most enduring in entertainment. 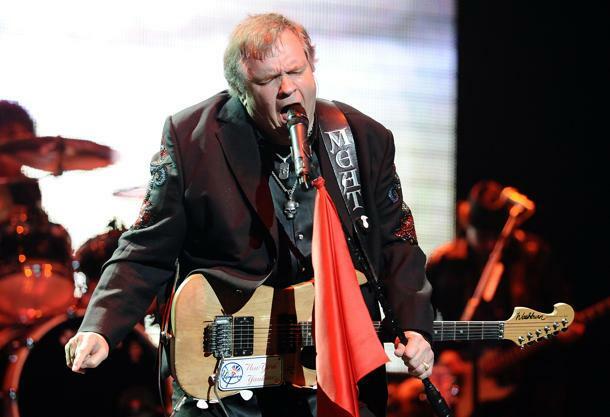 The multitalented artist, who started out musically in a band called "Meat Loaf Soul," went on to sell more than 43 million copies of his 1977 classic album Bat Out Of Hell alone. As an actor, he's particularly revered for his role of Eddie in the iconic American stage and movie versions of The Rocky Horror Show and Rocky Horror Picture Show, as well as his notable appearance in 1999's Fight Club. He competed in 2011's Celebrity Apprentice to nearly the end of the series, ultimately bowing to finalists Marlee Matlin and John Rich, and has appeared on many other television shows including a memorable cameo on Glee.